Reprinted from “Towards a new era of forest science in the boreal region”. Canadian Journal of Forest Research, 2016, 46(12): vii, 10.1139/cjfr-2016-0371. Sustainable forest management in an era of global changes has always been a central thematic area for the International Boreal Forest Research Association. 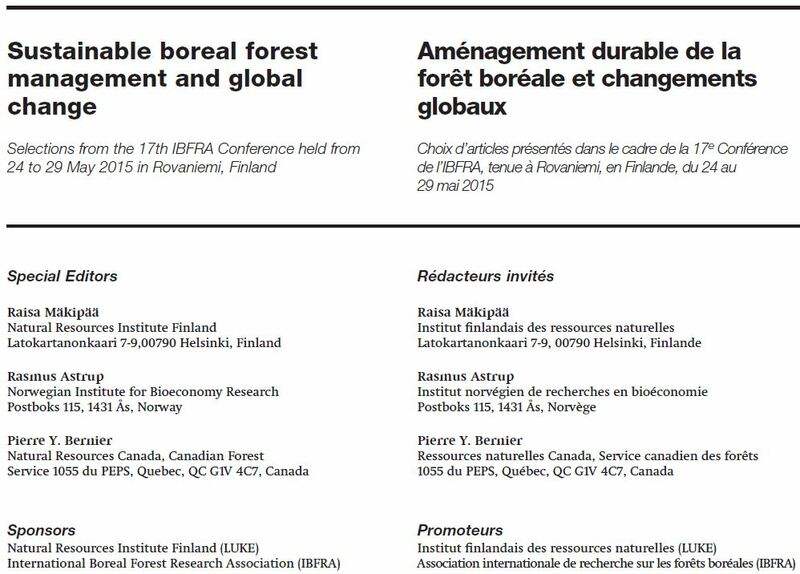 At the 17th IBFRA conference held on 24–29 May 2015 in Rovaniemi, Finland, the theme of global change was accompanied by a new theme related to the use and value of big data in boreal forest management and research. Keynote presentations had a clear message that sustainably managed boreal forests and peatlands play a significant role in climate change mitigation. However, the choice of the most efficient mitigation options will vary with regional differences in ecology, institutional strength, and management intensity. In addition to changes in greenhouse gas fluxes linked to ecosystem dynamics, the design of climate change mitigation strategies should also account for the fate of harvested wood products and for the substitution of more energy-intensive materials such as concrete and steel. For climate change mitigation, it is therefore not only forest management that matters, but also ensuring the best possible end use for the produced biomass. Key note presentations on use and value of big data in the forest sector demonstrated the role of time series of remote sensing data in forest monitoring and research. In addition, new technologies and methods including terrestrial laser scanning are starting to provide detailed three-dimensional information from forest stands from which management tools and scientific understanding will be developed. Finally, citizen science was shown to offer a vast potential for the generation of forest-based data. Thus, new means are being developed by which forest scientists and managers will be able to obtain new, more frequent, and more detailed information on the forest. The ensuing development of knowledge will benefit the forest sector, create new opportunities for furthering boreal forest science, and finally benefit the society as a whole. Keynote speakers at the IBFRA 2015 conference (www.ibfra2015.org) were Werner Kurz, Andrey Sirin, Mike Wulder, Mikko Kaasalainen, Tord Snäll, Leena Paavilainen and Taneli Kolström, and Urban Bergsten. In addition, the conference hosted 70 oral presentations and 60 poster presentations.